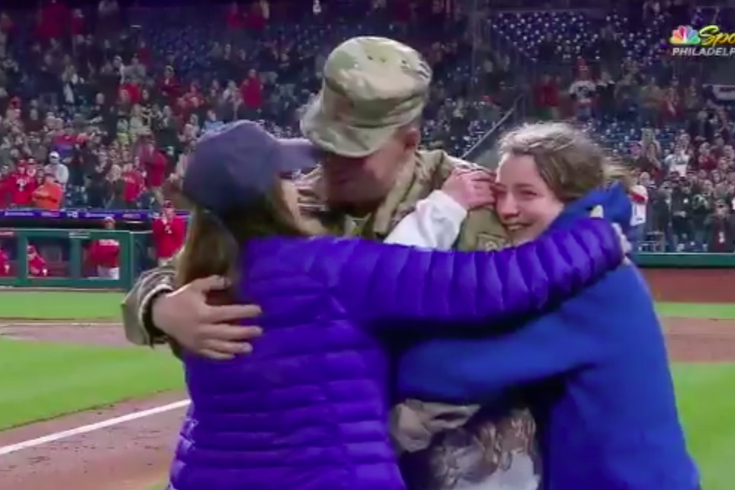 Air Force Major Robert Rowton embraces his family after surprising them at Wednesday night's Phillies game after returning from an oversees deployment. The Phillies won in extra-innings against the Cincinnati Reds on Wednesday night. The real winners, however, were the family of Air Force Maj. Robert Rowton. Rowton's wife, Jill, along with their daughters Bronwyn, 15, Abigail, 13, and Alena, nine, were dancing on the field with the Phanatic in the top of the sixth inning according to MLB.com's Todd Zolecki. What they didn't know was that dad was there at Citizens Bank Park after returning from a six-month deployment overseas. Rowton jogged onto the field in the middle of their dance routine, causing his family (and probably those in the stands) to cry tears of joy.